I love going on garden tours. They are especially wonderful if they are hosted by the gardener themselves. It’s great to start at one end, and slowly walk from flower to flower, talking over how this one is doing, and how that one came to be in its current home. I even take mini tours around my own garden, checking to see how everything is coming along. But eventually I need to sit down. Gardens are, after all, a good place to rest. Despite the work it takes to create and maintain them, all that work is useless if it doesn’t also offer some respite for weary muscles or a tired soul. And sitting down ensures that all work stops. You cannot snip another faded bloom or pull another weed while seated and still. I have been on the lookout for excellent places to sit in a garden and found some really great ones at the Reford Gardens in Quebec. 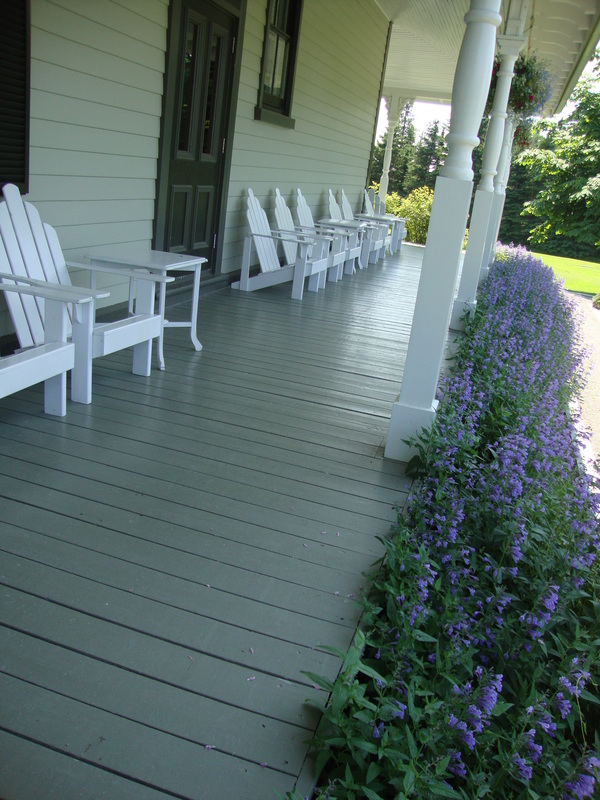 I loved the front porch of the original home with its long row of clean, white chairs. 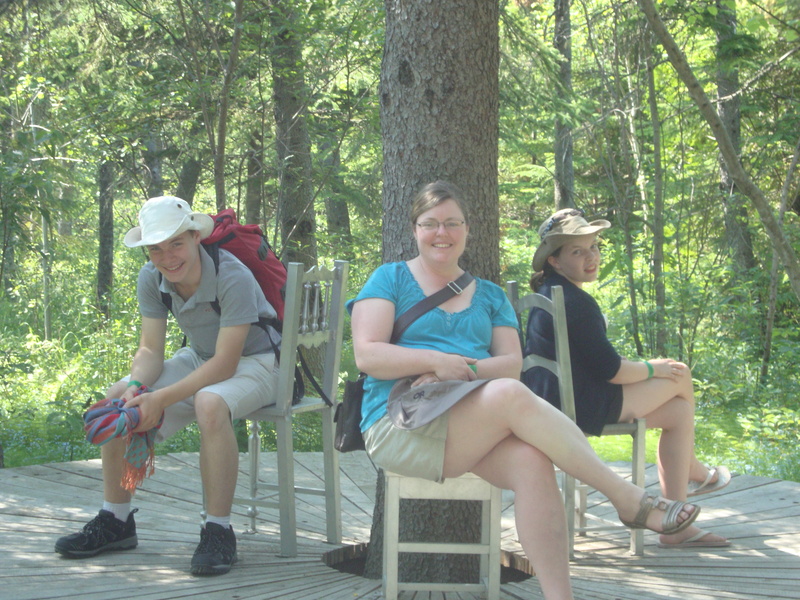 They are nicely shaded, comfortable, and offer a great view out over the lawn and out to the St. Lawrence River. Scattered throughout the gardens were funny little wooden chairs. They are shaped like many of the benches scattered throughout the gardens, but are much narrower and seats one person comfortably (two if you want to cuddle up, like my friends W. and K.). They are not just positioned looking out over vistas, but tucked into the walking paths here and there. It’s as if they were designed to give a place of rest along the way, before continuing the journey through the garden. I enjoyed sitting on one of them during an early morning visit, taking a few minutes to savour the fresh dewy smell and the pretty rock garden. I could imagine Elsie Reford sitting there herself, enjoying the cascades of pink phlox that tumble over the low brick walls in springtime. Not all garden seats need to be so formal, however. 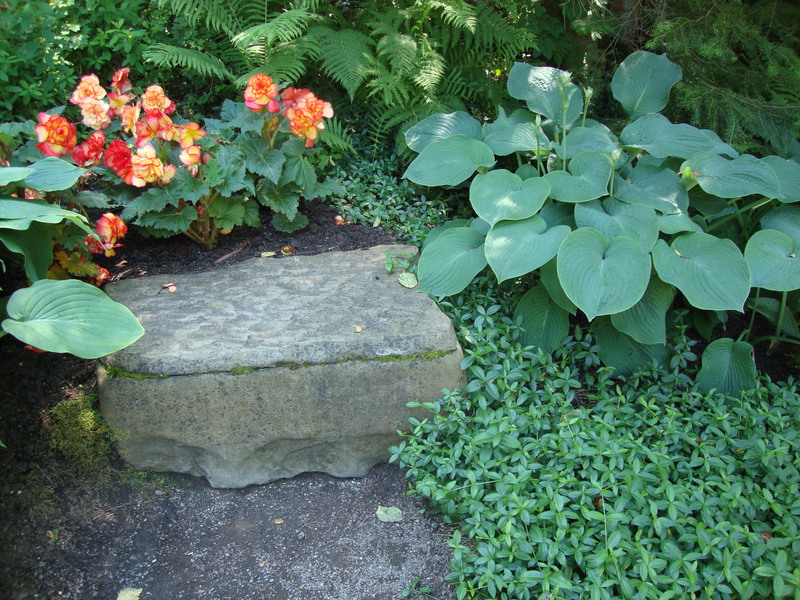 I loved one little perch made of rock and surrounded by hostas and begonias. It was in dense shade, and with my very fair skin that is prone to sunburns, this makes it an ideal spot to me. It is also made of stone, and would be cool even on a hot summer day. Right next to it was a stone bird bath, with one pink begonia floating in it. Lovely! And then there was the place I stopped to sit and laugh. As a part of the International Garden Festival, there was a tree surrounded by a wooden platform. On it were three wooden chairs where S., A. and I sat down. I have no idea what we started giggling about, but it quickly turned into making faces and laughing uproariously. Those are not things I usually associate with gardens, or with sitting down to rest, but they were welcome nonetheless. And none of it would have happened without those chairs! Alas, my own garden is currently bereft of anywhere to sit down. My two wooden Muskoka chairs began to rot several years ago and last year, and when the leg of one completely rotted and fell off, I made do by propping it up with a stone. This year, however, I was forced to dispose of them and have not yet found replacements. Reford Gardens has proven to me that I will definitely need to remedy that. Because every garden needs at least one–or maybe more–places to sit down and rest. Or cuddle up. Or even share a laugh. 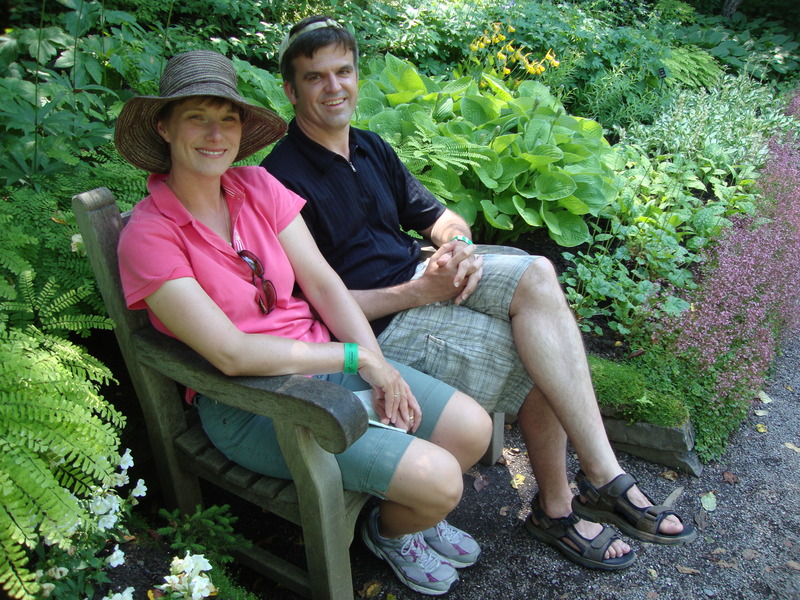 This entry was posted in Uncategorized and tagged garden, Quebec, Reford Gardens, rest. Bookmark the permalink. Beautiful place! I love the seats around the tree. That’s such a neat idea. It was fun sitting there, although strange because we each faced out a different direction and conversation was (almost) impossible. Perhaps the piece was making a statement. Thanks for reading! my neighbour has a bench surrounding the trunk of her beech tree. Lovely. Built for her by her neighbour. Me. Yes, I think it is lovely. I have no idea what happens when the tree gets too big, however….